Thought this would be a great present for my 3.5 year old. How could you go wrong with 3 dress-up costumes in one package. But you get what you pay for. These costumes are just tunics (open/no seam on the sides) that go over the child's head and tie around the child's waist. The cape does hide the tie. The material does not seem very durable and actually seems very cheap. The masks are much better and seem of higher quality. However...my son loves it. Put Batman on Christmas morning, and he wore it all day. Only took it off to take his pajamas off to put on his Christmas outfit. He wouldn't even take it off for our pictures, gave up on the fight. Maybe he loves it because it doesn't get hot like many dress-up costumes, it is wide open on the sides. In the long run, he is very happy with it, so that trumps my opinion. My 3 yr old son LOVES this set. He and his sister dress up like Batman and Robin everyday. He doesn't use the shin guards though and they are just taking up space in his trunk. The fabric is a little cheap and I am afraid to wash it for fear that the design will disappear, but he is getting great use out of it and it is a lot of fun. The capes are a little long and I worried at first that they would get caught or pulled, but they haven't yet so it hasn't been an issue for us. 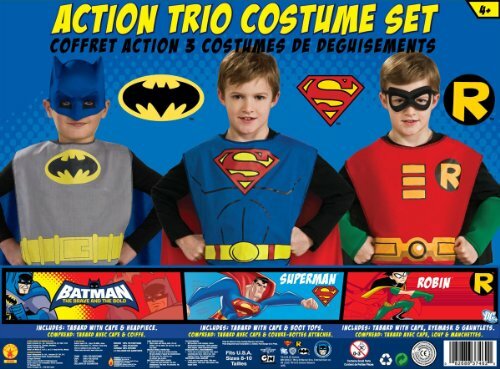 I would recommend this set to any little boy or girl who loves to dress up and loves superheroes. My son has always been a Batman fan. We first purchased this product when he was 2yrs old, so he could stop wearing his sisters' princess dress-up clothes. It is now three years later and he still wears it practically everyday ... sometimes even two costumes at once for extra powers. He also carries a costume in his backpack everywhere we go, in the event there is an emergency that requires a superhero. These costumes are simple for him to get on and off without parental assistance unlike the regular jumpsuit hero costumes sold during Halloween. This Summer we happen to be at the Jersey shore on Superhero day and since he had his costumes with him, he was able to join in all the dress-up fun without being overly hot. He even let his sisters borrow the other costumes, so they could participate in the various contests. We all had a blast.